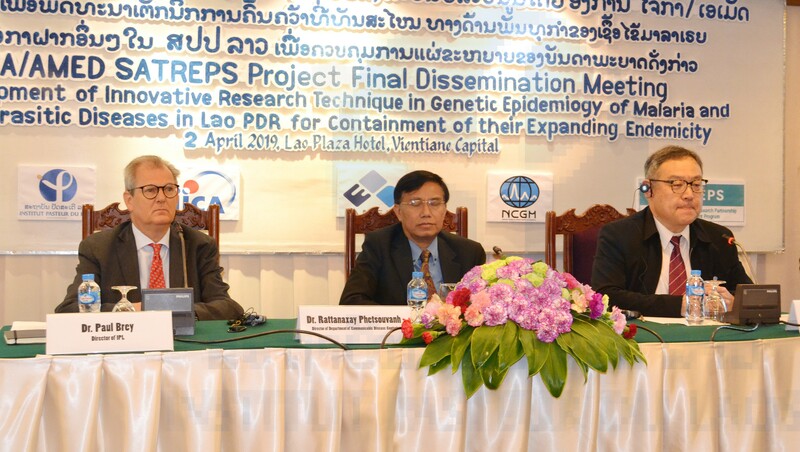 Final meeting of the JICA/AMED SATREPS project for “Development of Innovative Research Technique in Genetic Epidemiology of Malaria and Other Parasitic Diseases in Lao PDR for Containment of Their Expanding Endemicity” was held at Lao Plaza Hotel on 2nd April 2019, to disseminate outcomes of this five-years project. Dr. Shigeyuki Kano, SATREPS chief advisor from National Center for Global Health and Medicine (NCGM), Japan and Dr. Rattanaxay Phetsouvanh, Director General of Department of Communicable Diseases Control (DCDC), Ministry of Health (MOH) chaired the meeting. 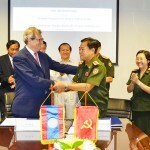 Japan International Cooperation Agency (JICA) and the MOH, Laos started a unique technical cooperation project on parasitology research in Laos on May 2014, in collaboration with Japan Agency for Medical Research and Development (AMED). This project promoted joint research between Laos and Japan under the scheme of Science and Technology Research Partnership for Sustainable Development (SATREPS). This project was implemented at Institut Pasteur du Laos (IPL), MOH, led by Dr. Paul Brey, Project Manager of the SATREPS and Director of IPL, with kind support of Dr. Bouasy Hongvanthong, Project Director of the SATREPS and ex-Director of Center of Malariology, Parasitology and Entomology (CMPE), the MOH. In this project, three important parasitic diseases in Laos, namely, Malaria, Schistosomiasis (blood fluke) and Opisthorchiasis (liver fluke) were targeted and many outcomes were produced. For example, high-sensitive and accurate diagnostic methods (PCR and LAMP methods) were developed, and many asymptomatic malaria carriers in the endemic areas were discovered by them. Rapid spreading of the drug (artemisinin) resistant malaria from the south to the north, even in Phongsaly province is another big finding through the SATREPS. In addition, the project discovered the first case of human infection with monkey malaria parasite (Plasmodium knowlesi) from Attapeu province. These findings are utilized for improving or updating national strategic plans for control and elimination of the diseases in Laos and the Mekong region. The project not only promoted research but also strengthened capacity of healthcare workers in the provinces where the diseases were endemic, and improved monitoring system of the parasitic diseases in the country, by collaborating with the MOH and WHO. The project will be terminated on the end of April 2019. However, the Japanese researchers, JICA, Neopharma Japan, and Eiken company Japan will collaboratively continue to support Laos for achieving Malaria elimination by 2030. 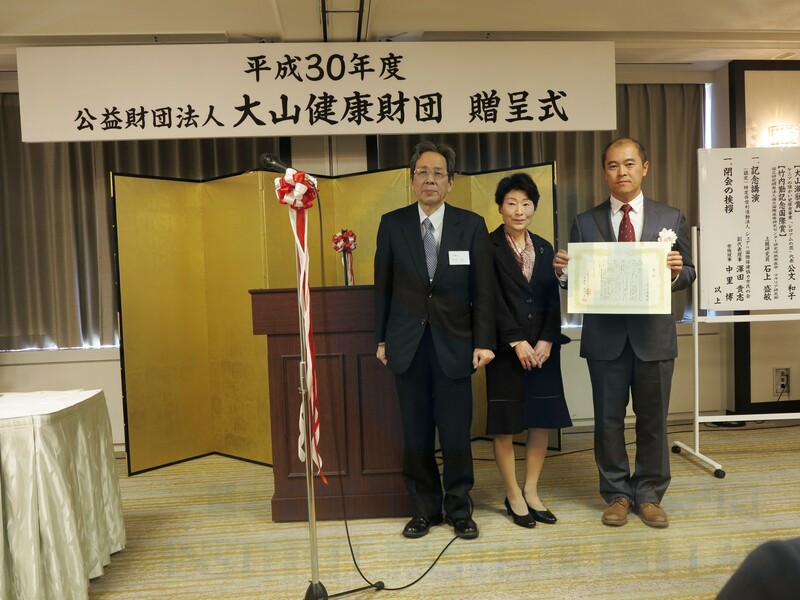 Professor Kamiya Shigeru, President of the Ohyama Health Foundation presented Professor Tsutomu Takeuchi International Memorial Award to Dr. Moritoshi Iwagami at the award ceremony in Tokyo, Japan on 14th March 2019. Dr. Iwagami was honored with his research career on the field of Parasitic Diseases and Tropical Medicine in developing countries, including JICA/AMED SATREPS Project for Parasitic Diseases in Laos at IPL. Mrs Reiko Takeuchi, wife of Professor Takeuchi also attended the award ceremony. L’Institut Pasteur a organisé, le 7 décembre 2018, une cérémonie en l’honneur des jeunes diplômés ayant réalisé leur thèse de science à l’Institut Pasteur au cours de l’année universitaire 2017-2018. Cette cérémonie existe depuis 2013. Ouverte par une conférence exceptionnelle du Pr. Serge Haroche, prix Nobel de Physique 2012, l’édition 2018 a mis à l’honneur, parmi ces jeunes scientifiques pasteuriens, cinq qui ont effectué leur thèse dans un institut membre du Réseau International des Instituts Pasteur. « Nous sommes heureux et fiers d’accueillir sur le campus de l’Institut Pasteur ces jeunes diplômés qui incarnent une nouvelle génération de chercheurs du Réseau International des Instituts Pasteur» a déclaré Marc Jouan, Directeur International de l’Institut Pasteur. Les cinq doctorantes ont réalisé leurs travaux dans les instituts Pasteur de Tunis, de Nouvelle-Calédonie, de Madagascar, Hellénique et au Pôle de Recherche Pasteur -Université de Hong-Kong sur des thématiques aussi variées que la caractérisation d’activités biologiques de protéines de glandes salivaires de tiques, l’étude des vecteurs d’arbovirose dans la région pacifique ou de la contribution des anophèles dans la propagation du parasite Plasmodium à Madagascar, l’étude des récepteurs liés aux maladies du système nerveux et l’étude de facteurs impliqués dans la réponse immune au cours de l’infection. Après un Master 2 en Microbiologie Fondamentale et Appliquée obtenu en 2012 à Brest, Élodie Calvez rejoint l’Institut Pasteur de Nouvelle-Calédonie (IPNC) pour travailler en tant qu’ingénieure dans le cadre d’un Volontariat de Service Civique. Pendant deux années, au sein de l’Unité de Recherche et d’expertise Dengue et Arbovirus, elle a travaillé sur divers projets, tels que l’étude génétique d’Aedes aegypti, principal vecteur d’arbovirus dans le Pacifique et a également commencé à étudier le virus Zika qui émergeait dans la région Pacifique. À la suite de ces deux années, Élodie a souhaité réaliser sa thèse à l’IPNC. C’est en 2015 qu’elle débute son doctorat sous la direction de Myrielle Dupont-Rouzeyrol, sur un sujet principalement centré sur les interactions virus/vecteur, et en particulier sur la transmission des virus de la dengue et du Zika par le vecteur Ae. aegypti. 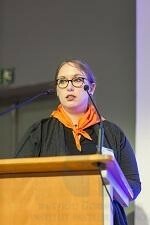 Au cours de ces trois années de thèse, elle a complété sa formation en réalisant un stage de six mois à l’Institut Pasteur, dans l’unité Arbovirus et insectes vecteurs, dirigée par Anna-Bella Failloux et en participant au cours « Insectes vecteurs et transmission d’agents pathogènes » à l’Institut Pasteur. Après l’obtention de son doctorat, Élodie a souhaité poursuivre ses recherches dans le Réseau International des Instituts Pasteur. 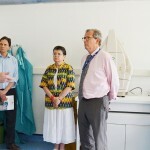 Elle a ainsi rejoint l’unité Arbovirus et Maladies Virales Emergentes dirigée par Marc Grandadam à l’Institut Pasteur du Laos. Elle y étudie la caractérisation génétique et la transmission des arbovirus, et plus particulièrement le virus de la dengue, par les insectes vecteurs locaux. Élodie participe aussi activement à la formation en laboratoire du personnel lao. 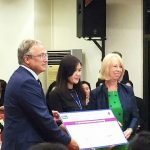 Malaria Consortium and Mahidol University set up an entomology scholarship in memory of Dr Sylvia Meek, former Malaria Consortium Technical Director, to honor her outstanding work to help reduce the impact of vector borne diseases. Somsanith Chonephetsarath, laboratory technician in the Medical Entomology and Vector Biology Department at Institut Pasteur du Laos, was successfully awarded the Dr Sylvia Meek Scholarship, which will allow her to take on a two years’ masters. Members of the Fondation Mérieux Delegation including Mme Mireille Guigaz (Vice Chair of the Global Fund), Prof. David Heymann (Vice President of the Board of Directors of the Fondation Mérieux), Dr. Francois Xavier Babin (Director of International Development, Fondation Mérieux) and Dr. Laurant Malato (Representing the Fondation Mérieux in Lao PDR) visited IP Laos on the 2nd of July 2014. Dr. Ponmek Dalaloy (Former Minister of Health of Lao PDR and Honerary Chairman of the Board of IP Laos), Dr. Paul Brey, (Director of IP Laos) and Dr. Darouny Phonekeo (Deputy Director of IP Laos) presented the research activities ongoing at IP Laos and also provided a guided tour of the research and training facilities. Dr. Marc Grandadam (Head of the Arbovirology and Emerging Viruses lab at IP Laos) explaining the research activities of his group to Mme Mireille Guigaz, Prof. David Heyman and Dr. Francois Xavier Babin. 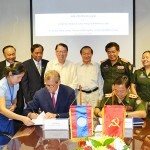 The Institut Pasteur du Laos (IPL) and the Disease Prevention Institute of Military Health Department (DPIMHD), Ministry of National Defense signed a Memorandum of Understanding for research and training in the areas of infectious/parasitic disease diagnostics, vector control and biomedical research. IPL and the DPIMHD have previously engaged in training in the area of dengue virus diagnostics and serotyping, as well as vector control. 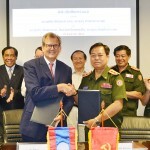 The MOU will allow DPIMHD staff to carry out on-the-job training at IPL and also allow IPL staff to provide training at the Lao Army hospital laboratories and training facilities. 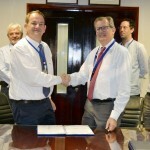 The MOU will also allow the parties to write joint grant proposals. 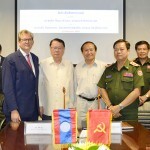 The signatories were Lt. Col. Dr. Xaysaveng Phommatha, Chief of the Disease Prevention Institute, on behalf of the Lao Department of Military Health and Dr. Paul Brey, Director of IP Laos, Lao Ministry of Health. Witnesses were Col. Dr. Bounteun Bandavong Chief of the Department of Military Health and His Excellency, Dr. Ponmek Dalaloy, former Minister of Health of Lao PDR and Honorary Chairman of IP Laos. Representatives of the Cabinet and Department of Communicable Disease Control of the Ministry of Health and Members of the Lao Department of Military Health also attended the ceremony. 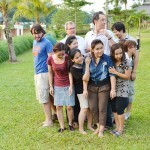 IP Laos Group photo in the garden of the Riverside Boutique Hotel. Scientific, Technical and Administrative exposés at the Riverside Boutique Hotel conference center. It is well know fact that an organization is only as good as its staff! The administration of IP Laos highly values its young staff, as they will guarantee the future of Institut Pasteur of Laos. 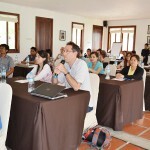 As such, we recently organized a 3-day retreat for the entire staff (Scientific, Technical, Administrative & Logistic) at the Riverside Boutique resort in Vang Vieng City, 3 hours outside the capital. The idea was to get to know each other better, to better understand the job and responsibilities of each person and how each individual contributes to the overall success of IPL. The first day was spent giving brief exposés (all in English) on the scientific, technical and administrative work ongoing at IPL. The second day was dedicated to mixed group team building exercises that obliged the staff to work together to find solutions to complex problems. We also had sporting events, kayaking down the Nam Song River and swimming in the hotel pool. These 3 days together brought the staff closer together help to further forge a solid IP Laos team. Funds permitting we plan to do this type of retreat on an annual basis. 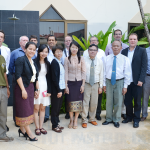 MALVEC consortium meeting, 23-24 april 2014, Vientiane Lao PDR. 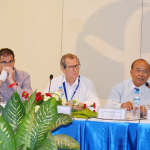 Dr H. Overgaard (Institut de Recherche pour le Developpement, Kasetsart University Thailand), Dr V. Corbel (IRD, Kasetsart University Thailand), Dr P. Brey (Institut Pasteur du Laos, director), Dr S. Nambanya (National Center of Malariology, Parasitology and Entomology), Dr S. Marcombe (Institut Pasteur du Laos). The MALVEC project “Characterization of insecticide resistance in malaria vectors in Lao People’s Democratic Republic and Thailand and capacity building in medical entomology” aims to improve strategies for prevention and control of malaria in Laos and in border areas with Thailand. The project has the following specific objectives: 1) to determine the distribution of vectors and their role in malaria transmission; 2) to determine the levels and mechanisms of resistance to conventional insecticides; 3) to determine the impact of environmental factors on the spatial distribution of vectors and selection of resistance, and 4) to build capacity in medical entomology (malaria) in Thailand and Laos. The results for year 1 of the project were presented and discussed between the partners and invited experts in malaria field. MALVEC meeting participants, Vientiane, Lao PDR. Signing of Memorandum of Understanding between Institut Pasteur du Laos (Dr. Paul Brey, Director) and Luxembourg Development Agency (Peter Heimann, Chief Technical Advisor) for cooperative projects in the area of Vaccine Preventable Diseases. 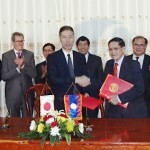 The Government of the Grand Duchy of Luxembourg is a major donor of the Institut Pasteur of Laos. Signing ceremony by Japan International Cooperation Agency (JICA) and the Lao Ministry of Health for the SATREPS project on “Development of Innovative Research Technique in Genetic Epidemiology of Malaria and Other Parasitic Diseases in Lao PDR for their Containment of their Expanding Endemnicity”. This project will be carried out for the most part at Institut Pasteur of Laos and Centre for Malariology Parasitology and Entomology for a period of 5 years. This technical assistance is important and timely given the fact that Plasmodium drug resistance may be suspected in Lao PDR and the region and could impact the world malaria situation. Dr. Shigeyuki Kano and his team from National Center for Global Health and Medicine (NCGM), Tokyo are working at the forefront of this subject, will establish a lab within Institut Pasteur of Laos. 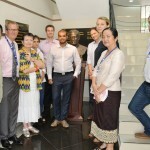 Furthermore, NCGM and Institut Pasteur of Laos have composed a team of experts to address the subject of Malaria drug resistance, but also on the study of other parasitic diseases, such as Schistosomiasis and Opistorchiasis, which also plague Lao PDR.